Can contractors and specialists add value to a project by their early involvement in design, pricing, risk management and programming? How can this be structured and what role do contracts have to play? What is the impact on procurement and project management? Commentators from Banwell to Egan have recommended earlier contractor appointments, and this has also been linked to successful project partnering. How are the two related? 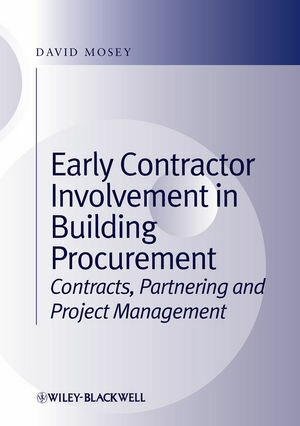 Early Contractor Involvement in Building Procurement considers the case for a two stage procurement approach based on a system of agreed project processes during the preconstruction phase. It examines the ways in which a contract can describe and support this model throughout its procurement, partnering and project management, and is illustrated with case studies taken from projects and programmes across the construction and engineering industry. The roles of the various parties involved, the obstacles they encounter and the benefits they can achieve are examined in detail. There is practical guidance on how to improve speed, economy, sustainability, change control, dispute avoidance, and client satisfaction. This book bridges the gap between contract law, partnering and project management and will be essential reading for middle and senior management at construction contractors, consultants and clients in both the public and private sectors. David Mosey is head of the Projects and Construction Group at Trowers & Hamlins, and is a specialist in UK/international construction and engineering law with over 30 years’ experience. He advises project teams engaged on a wide range of building and infrastructure projects. David has been described as a ‘partnering guru’ and has guided his clients through more than 200 partnered projects and programmes with values ranging from £1m to £800m. He is the author of PPC2000, the first Standard Form of Project Partnering Contract, and co-author of both the SPC2000 Specialist Partnering Contract and the TPC2005 Term Partnering Contract. Introduction – Who Remembers Mott the Hoople? Chapter 1 Early Contractor Involvement – An Overview. 1.1 Early contractor involvement – why bother? 1.2 Early contractor involvement and project pricing. 1.3 Early contractor involvement and risk transfer. 1.4 Early contractor involvement and payment. 1.5 The role of building contracts. 1.6 The limits of construction phase building contracts. 1.7 Contractor contributions to design, pricing and risk management. 1.8 The client, communications and project programmes. 1.9 But do you need an early building contract? 1.10 Preconstruction commitments under framework agreements. 1.11 The infl uence of project managers and project partnering. 1.12 So what is stopping us? 1.13 Government and industry support. Chapter 2 Conditional Contracts and Early Project Processes. 2.1 The conditional preconstruction phase agreement. 2.2 Recognised categories of contract. 2.3 Effect of the number of parties. 2.4 The planning function of contracts. 2.5 Choices and contractual conditionality. 2.6 Limited effi ciency caused by unknown items. 2.7 Risk and fear of opportunism. 2.8 Conditional relationships without full consideration. 2.9 Need for long-term relations. 2.10 Alignment of different interests. 2.11 Preconstruction phase agreements as project management tools. 2.12 Contracts and new procurement systems. Chapter 3 Problems and Disputes Under Construction Phase Building Contracts. 3.2 The role of standard form building contracts. 3.3 Standard forms and the assumption of complete information. 3.4 Origins of standard forms and lack of trust. 3.5 Criticisms of effectiveness of standard forms. 3.7 Links between claims and preconstruction phase activities. 3.8 Links between claims and building contracts. 3.9 New procurement procedures or gambling on incomplete information. Chapter 4 Early Contractor Involvement in Design, Pricing and Risk Management. 4.4 Preconstruction risk management processes. 4.6 Perceived benefi ts of early contractor appointments. 4.7 Early contractor appointments and sustainability. 5.2 The role of the client. 5.3 The role of communication systems. 5.4 The role of binding programmes. Chapter 6 Contractual and Non-contractual Preconstruction Options. 6.5 Benefi ts of contractual clarity. Chapter 7 Preconstruction Commitments Under Framework Agreements. 7.1 Commercial attraction of frameworks. 7.2 The relationship between frameworks and partnering. 7.3 Frameworks and preconstruction phase processes. 7.4 Published forms of framework agreement. 7.5 Frameworks and the Private Finance Initiative. 7.6 The impact of frameworks on changing behaviour. Chapter 8 Project Management and Project Partnering. 8.2 Preconstruction phase agreements and project management. 8.3 Preconstruction phase agreements and partnering. Chapter 9 Obstacles to Early Contractor Appointments. 9.6 The role of the partnering adviser. Chapter 10 Government and Industry Views and Experience. 10.2 Importance of government and construction industry support. 10.3 Support for contractor and subcontractor design contributions. 10.4 Support for two-stage pricing. 10.5 Support for selecting contractors by value. 10.6 Support for joint risk management. 10.7 Support for greater client involvement. 10.8 Government and industry views on partnering. 10.9 Government views on preconstruction phase agreements. 10.10 Industry experience of preconstruction phase agreements. 10.11 Preconstruction phase agreements in an economic downturn. Chapter 11 Conclusions – the Golden Age Of Rock ‘n’ Roll? 11.1 Functions of building contracts and their potential to govern project processes. 11.2 The assumption in standard form building contracts of complete project information and consequent problems and disputes. 11.3 Preconstruction phase processes that can be improved by early contractor appointments. 11.4 The role of the client, communication and programming of preconstruction phase processes. 11.5 Contractual and non-contractual options to govern preconstruction phase processes. 11.6 Increased preconstruction commitments under framework agreements. 11.7 The relationship of preconstruction phase agreements to project management and partnering. 11.8 Circumstances and attitudes that are obstacles to early contractor appointments or to preconstruction phase agreements. 11.9 Government and industry support for early contractor appointments under preconstruction phase agreements. Appendix A Project Case Studies. Use of Preconstruction Phase Agreements on Single Projects. Use of Preconstruction Phase Agreements on Multi-project Frameworks. Appendix B Preconstruction Phase Processes Under Standard Form Building Contracts. Appendix C Preconstruction Phase Processes Under Standard Form Framework Agreements. Appendix D Form of Risk Register. Appendix E Form of Partnering Timetable. Appendix F Association of Partnering Advisers Code of Conduct. Part 2 Articles and books . Part 3 Government/industry reports . Part 4 Table of cases.